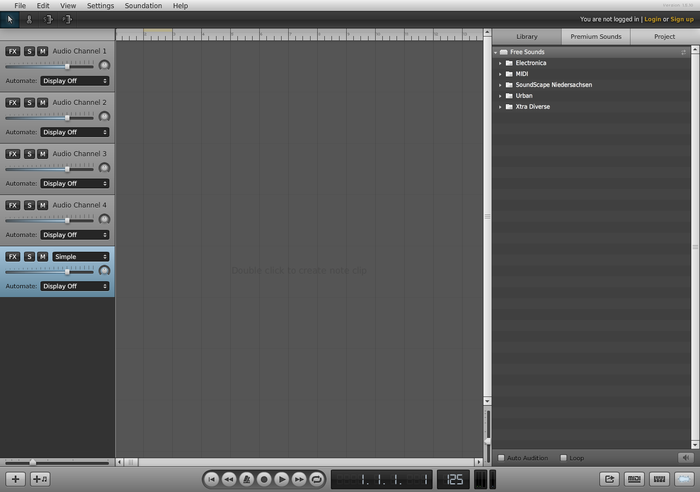 EQ: How can we create expression and special effects in Soundation? Students will use Soundation to create expression and Special Effects. Soundation - Music creation program that allows the composer to add pre-recorded beats together. Tempo - The speed of music. Dynamics - The volume of music. Remember back to the lessons on expression. Where were they types of expressions and How can we create them? Click on the link above to review expressions! Need more review? Check out the lessons on expressions in Moodle. 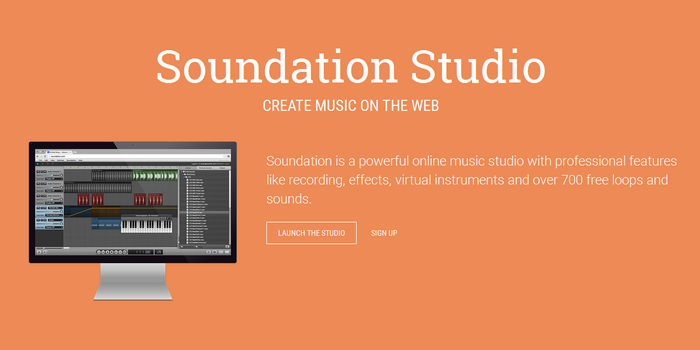 Go to the Soundation Studio website. Open a project you have already been working on and practice using the following expressions and special effects. 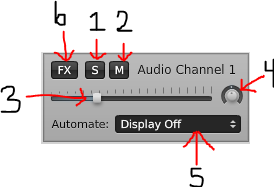 What does the audio channel box do? "S": Solo Button - Press the "S" to hear only this audio channel. "M": Mute Button - Press the "M" to mute or make this audio channel not play. 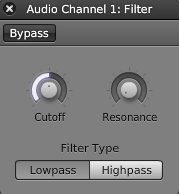 Volume Slider - Move the slider to the left or right to make the channel softer or louder. Pan knob - The pan knob decides which speaker the sound comes out. This is easiest to hear if you are wearing headphones. Automation display: This box allows you to control the volume and pan automatically! 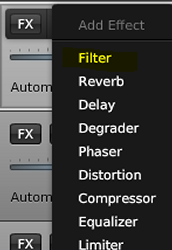 "FX": Special Effects: This button allows you to create special effects such as echoes, filters and more! Click on the "Display off". This gives you two options. You can select either Volume or Pan. When you select volume, it will show up with a gray line. Click on the gray line and it will make the line Yellow and create a dot where you clicked. Create a dot closer to the top and it makes the clip louder. Create a dot closer to the bottom it will be softer. When you select Pan, it will show up with a gray line. Click on the gray line and it will make the line Yellow and create a dot where you clicked. Create a dot closer to the top and it will make the sound come out of the right speaker. Create a dot closer to the bottom it will make the sound come out of the left speaker. The "FX" button will allow you to add special effects. 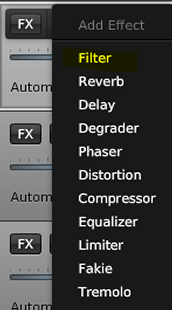 Click the "+" sign to get the effects options. Once you select an effect it will show up with a special effects box like the one below. Then you can play with the knobs and see what it sounds like! Interested in more on the special effects? Click Here. Allows you to cut clips in half and delete out parts you don't want or need. 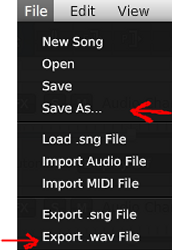 When in this mode every time you click it will cut the sound clips. Stretches the file. This will let you change the tempo of the sound clip. Simply pull the bottom corner and it will change the tempo of your clip. Stretches and changes the pitch. 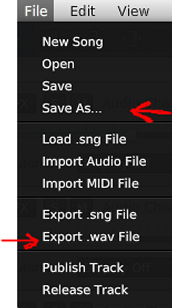 This will alter the file in tempo and pitch when you move the bottom right hand corner. Click on the number at the bottom of the screen and drag your cursor up and down. This will increase and decrease the numbers which changes the tempo of the entire piece! The higher the number the faster the tempo. Once you are happy with your create for today. Work in Soundation and and play with all these expression and special effects. Spend about 20 minutes and be sure you are able to successfully use at least 3 of the effects or expressions above. Once you are done answer the quiz question below and be ready to use the skills you learned in the following lesson.